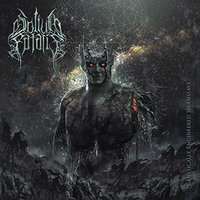 SOLIUM FATALIS is a Death Metal band from New Hampshire, releasing upon us their fourth full length album “Genetically Engineered to Enslave.” From the very first song, “Threshold,” this album grabbed me by the throat and never let go. As far as Death Metal goes, this band is extremely adapted to writing catchy songs that always find a hook to impale. Between Saltzman’s mind boggling fast double bass, DeMarco’s searing vocals/bass, and the twin riff attack of guitarists Gregory and Beevers, this song is the perfect opening track that attacked first and asked no questions after. I’m not sure which of them played the guitar solo but they need an award for being a badass. “Synthon,” fires right out of the gate with a solid rhythm lead and robust leads that meld perfectly with DeMarco’s vocals. The passage in between the lyrical stanza are more than interesting enough to keep the song flowing to the 1:40 mark where the band kicks everything balls out into high gear. Another badass solo/rhythm riff bridges the song together for a nice finish. “Chemical Reagent,” has a creepy melodic vibe before a harrowing scream fills the silence. Extremely fast riffs along with bass and furiously crisp drumming join in for a cacophony of Death Metal. That creepy beginning comes back some more during the song and the band gets heavier and heavier after each time until the 3:06 mark. It is here that machine gun riffs lead the way for the entire band to lay waste with a sonic assault that almost destroyed my headphones. All four guys are just so good at what they do. They don’t play simple music by any stretch of the definition but nor do they go into technical territory; they are talented enough to appease both fans of straight forward Death Metal to people who prefer their stuff with a bit more gusto in the approach. These points could also be applied to their song writing; obviously they are Death Metal but they don’t too heavy nor would I call anything on this album Melodic Death. The band just knows their instruments very well and have a clear vision of what they want to achieve. I also appreciated that all of the songs, save for one, were under the five minute mark. More than any subgenre, it seems Death Metal bands have a tendency to forget when to cut the song off but not these guys. Every note, every scream/growl, every snare hit…everything they write and play has a purpose and not one second is filler or wasted.